The big four are squaring up again this week, with Flamengo vs Boavista on Tuesday, January 29th, Vasco vs Portuguesa-RJ and Fluminense vs Madureira on Wednesday, January 30th, and Botafogo vs Resende on Thursday, January 31st. RIO DE JANEIRO, BRAZIL – This weekend saw all four of Rio’s major football (soccer) teams competing in the third round of the Taça Guanabara, with a 2-1 victory for Flamengo over local rivals Botafogo on Saturday, January 26th, followed by a 3-1 victory for Fluminense as they dispatched Portuguesa-RJ on Sunday, January 27th, and a 1-0 victory for Vasco against Americano later on in the day. This Saturday saw Botafogo lose their second game out of three played, leaving the team with a total of five goals conceded, only two goals scored, and still without a victory, photo courtesy of Vítor Silva/SSPress/Botafogo. 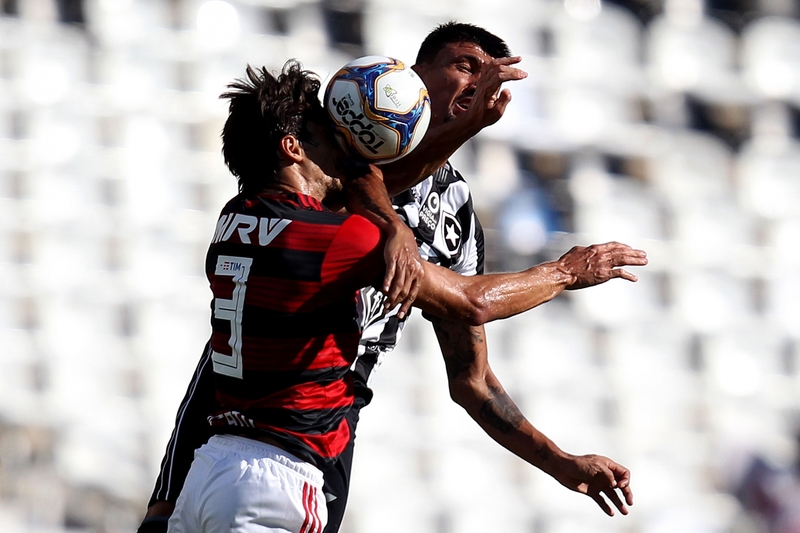 If Botafogo’s defeat in the first round of Rio’s Taça Guanabara cup was a surprise, perhaps this one seemed a little more predictable, with group leaders Flamengo dispatching the ‘O Glorioso’ 2-1 to claim seven points, while leaving Botafogo lingering at the bottom of the table with only one solitary point. However, it was Botafogo who opened the scoring with a fortunate goal in the twenty-second minute. The leaders then continued to apply pressure throughout the first half, with both teams providing plenty of chances, but it was Botafogo who again came closest to making it two when Erik hit the woodwork three minutes after the break. Flamengo were able to turn things around due to some lax defending from Botafogo. A pinpoint cross from Gabigol found the free head of Flamengo’s star player of the afternoon, Bruno Henrique, who steered the ball into the back of the net after eighteen minutes played in the second half. On Sunday, Grupo B’s second-placed Fluminense took on Portuguesa-RJ, who are currently bottom of the group. The ‘Tricolor’ scored early on as a searching cross found Ezequiel unmarked in the Portuguesa-RJ box, leaving him with a free header and an easy first goal after just thirteen minutes played. Portuguesa-RJ didn’t capitulate and their intrepid play was rewarded with a handful of chances in the first half to draw level; however, Fluminense’s goalkeeper, Rodolfo was in top form, making some world class saves to keep the bigger team in front for the first forty-five minutes. Fluminense started the second half well, with Mascarenhas hitting the woodwork with a powerful long-range free-kick three minutes after the interval. Down the other end, Portuguesa-RJ’s Romarinho also hit the crossbar with a fine strike, as the trailing team refused to give in. In an exciting last quarter of the match, Fluminense doubled their lead, with Yony González calmly placing the ball beyond the reach of Portuguesa-RJ’s goalkeeper, Ruan, in the thirty-fourth minute. Portuguesa-RJ responded admirably, and they finally found the net after thirty-six minutes, when Douglas Eskilo stylishly nutmegged the helpless Rodolfo. However, as Portuguesa-RJ searched in vain for an equalizer, Fluminense were able to launch a counter attack that ended in Luciano directing the ball into the back of the net for a third and final goal for Fluminense, ending the game 3-1. Vasco are riding high with their record three wins, which puts them firmly on top of Grupo B with nine points, photo internet reproduction. Vasco were able to end the weekend on a high when they beat Americano 1-0 to retain their one-hundred-percent winning record. After a fairly uneventful first half, the Grupo B leaders were able to open the scoring with a skillfully-directed header courtesy of Marrony, two minutes into the second half. Americano had a few decent chances to draw things level in the second half, but Vasco were saved any stain on their record by the safe hands of their goalkeeper, Fernando Miguel, who did well to keep a clean sheet and send Vasco into the fourth round with another victory.